Daily Equine Forum - Hurt Leg what to do? 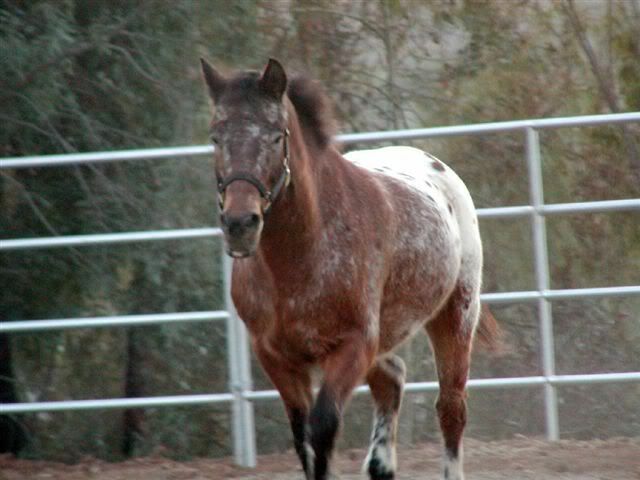 hey when we went out to feed my 6yr.qh friday. I noticed that his leg was bleeding really bad. After checking it out their is a 4-5in. gash on the front of his back leg,with a 1.2-1in. hole in his leg. Also on the backside of the same leg their is a gash. The cuts are very deep and mangled. When i called the vet she said that if it was mangled that she could not sew it up, but to bandage it. WE cleaned it with soap and water the best that we could and bandaged it up. Do you have any suggestions for antiseptic spray's or ointment to put on the cut to help for pain and make heal time faster. The vet game me an anitbiotic to put in his feed. but was wondering if theirs not something else that i could do. Do i need to keep him in a stall while he's healing? How long should i expect for heal time? Any suggestions would be helpful. thanks.. I'd talk to the vet again. A phone call to her should answer your questions. Being as none of us can see the injury, and I, myself, am not a vet....I'd hate to give you advice on this. lil bit, I agree with Saddletramp. On injuries like this, and serious health care issues, it would always be advisable to consult with your vet . Before calling the vet again, sit down and make a list of questions that you want to ask, leaving room between each question to jot down her answer. If you still feel uneasy, perhaps ask her to come out and look at it in person. Agreed. Get the vet to look at the injury. Any deep cut on the leg can be trouble and puncture wounds can become infected easily. Is he UTD on shots, especially tetanus? "Mangled" to you might not be "mangled" to a vet though. Tissue can be cut away to provide a clean area to sew together, however, there's not much extra skin on the lower leg. Is he lame? Can you take pictures & post them? It's not going to take the place of a vet exam but we might be able to offer additional advice. Vet should come out and look to be safe. Antibiotics good. Has your horse had recent tetnus shot? If it was a human, (or horse for that matter) I'd use a Q tip to determine depth of puncture. I'd irrigate the wound out with Saline and a syringe. Hose would work fine too. I'd load up a syringe with Betadine, ie Iodine and shoot that into pucture wound for quick kill bacteria, let it sit few mintues, then rinse it out. (Betadine toxic to new tissue growth). Whether I'd pack it or not would depend on depth and width. If shallow narrow and moist or draining, I'd just cover it with gauze and vet wrap. If deep tunnel, I'd get some "Nugauze" (Iodoform if available)moisten it and put a "wick" in the wound, not packing tight, loose to allow to drain, prevent top of wound from closing over. Can do the same thing with opening up a folded gauze, moisten, and use the Qtip to slide corner of gauze in. Cover with gauze and vet wrap. I would also recommend asking about giving a tetnus shot. Wrap also helps to stop Proud Flesh. Of course a vet should look at it. I don't know about with your vet but mine is over an hour away so if I can't trailer a horse(like when Coal was hurt, she couldn't put weight on the leg enough to go in a trailer) I have taken photos to the vet when we couldn't get down there soon enough. It isn't a best case and if this is the first inuury you are dealing with it would be best to have the vet out to look at it even if stitches aren't going to happen. There isn't much on the legs so it's easy for them to cut something major. Ditto on contacting the vet again. Hey all. I took yalls advice and contacted the vet again. She assured me that as long as im keeping it clean and bandaging it that it would just take time to heal. Although i was a little irritated of the fact that she just seems to not want to come out and take a look at it. So i called a different vet. And he said that if it was able to be sewn up that it was too late to do that now. But i went to the supply store and they gave me some furenal?(prob. not spelled right) Its a sab to put on his wound, along with the antibiotics i put in his food, it seems to be doing okay. I did realize that the wound that was on the back of the same leg with the gash. Was not a wound at all just were all the blood had ran too. Which made the false apperance of another gash. But he has been walking around pretty good, and hasnot tried to kick while we are wrapping him up. I think the sab makes it feel better. So the wound was not as bad as first suspected. Do i need to call my vet and force her to come out and take a look at it? Any idea on why she hasnt been yet? I would think with a leg injury she would have insisted on seeing him in person. NOt just giving me advice over the phone. Okay well this is my update. So thanks again yall. You would think most vets would be the other way---wanting to come out even if not necessary for the $$. So maybe they just really felt it wasn't necessary--have they been a good vet other than this?? Sounds like a vet I know, and don't use that much unless I have too. But without seeing the horse or knowing the vet it's hard to say if it's the vet not wanting to bother or if it really isn't needed. Had the vet been out to see it once before? My good vet doesn't just come running out at any little thing, mainly because it's over an hour drive but if I really wanted him too he would even if he feel it wasn't totally needed. Part of being a good vet is taking care of the owners too. A vet that won't listen to the owner or doesn't care what the owner wants/needs is not an easy vet to work with. She has come highly recommended by my boss. Who owns horses and mules. Although i do use their offices for my blue pit bull puppie. We have only had diago since july and he was up to date on everything when we bought him. So i havent had a need for a vet for him until this incident. . Diago's shots arent due until jan. I hope that maybe it isnt necessary for her to see him, but i really dont want to take that chance.Esp. since we are new to horses. And we are only 5miles from her office. Well i think that i am going to look for another vet in the area. because i dont even know the signs of infection if that was to happen. I am just not educated enough on horses for me to feel safe about his leg. Which if a vet wants my $$ then they should accomodate me just make sure that he is okay. Even if it might not be completely necessary. Right?? My boss just informed me that the only thing on the front of their legs under the knee bone is mainly just hide. Is that true? Nothing that he could damage on that particular spot.? Here is an article with an illustration that might help you figure out if your horse might have damaged a tendon but if he's sound, then I doubt that he did. I believe I'd look for a new vet too. I can't believe that she is only 5 miles away and wouldn't come out. Is she a large animal vet? If it makes you feel any better, the job of the antibiotic is to fight infection....so he is probably covered in that dept. Whenever you change the bandage tho, put the palm of your hand on the leg and feel for heat. If you aren't sure if you are feeling regular body warmth or heat from infection, move your hand to the same spot on other leg, then back to the injured leg and compare the level of warmth. Watch for drainage from the lowest point of the wound and note the color of the drainage....clear or cloudy, bloody, green and goopy...pus usually signals infection. Check the surface of the previous bandage to see if it absorbed any drainage. If it's any consolation, my current vet would probably try to save me the farm call by helping over the phone or email. Either she would ask it I'd like her to come out or I could ask her to come out if it was something that we didn't think that I could handle. But I know how you feel because when I had a true emergency here a few years ago, my former vet did not come out even though my farm was on her way home. I scrambled to find meds thru friends, and her vet tech DID bring me some meds many hours later. But the vet never return my call to ask how things were going, or if I did indeed need to schedule a visit. I think it was a case where my emergency fell on her "small animal" day and there was no way that she could shuffle things around. Over time, I've had boarders who have used her and there are no hard feelings either way, but I now know who to call in a pinch. And from the consumer's point of view....is it a bad thing to use a couple of different vets? If one happens to be out of town or off the clock, when needed, you need to have someone else who can be contacted. I do like the idea of having my regular stuff done by my usual vet, but she knows who I'd call if she were unavailable.